Do you know Tuesday November 28th is #GivingTuesday? This is a global movement when millions of people use social media to support and champion the causes they believe in by donating and fundraising on their behalf. It happens the Tuesday after Thanksgiving (in the U.S.) and kicks off the charitable season when we focus on holiday and end-of-year giving. Facebook will be waiving its fees for donations made to nonprofits on Facebook and the Bill & Melinda Gates Foundation will be matching up to $2M of funds raised on Facebook for U.S. nonprofits. How can you help PARCA that day? Create a fundraiser for us! Visit Facebook.com/fundraisers, click “raise money” and select us! You can also click on the donate button on our cover photo on #GivingTuesday 11/28. Finally, add a donate button to a Facebook post or live video. Tag us in a post or add “#donate” to your post and you’ll get a prompt to add a donate button. Doing a live video? Tap “live” at the top of your News Feed and click “Add a donate button” from the menu. 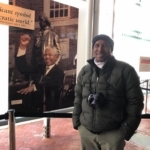 As you know, PARCA recently hosted our friend from Africa. We enjoyed almost two full weeks of sightseeing, showing him our little corner of the world, and telling stories. 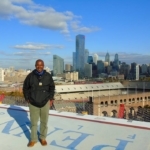 He shared his stories of the impact of conservation work with docents and staff at the Philadelphia Zoo and with PARCA supporters. He shared many stories about how the work we are all doing not only benefits the rhinos, but also the people. The obvious impact is on those working directly with the rhinos – vets, helicopter pilots, those with jobs tracking and monitoring their safety, and even the safari guides. But there are so many other jobs supported by these efforts…reservation agents, baggage handlers, and all of the other folks working for the airlines who fly tourists in to see the rhinos and all the safari camp staff. One of the best stories he told was about his own family. He had been working with the teams for a long time planning for the arrival of the rhinos. His family started to tease him at some point that they didn’t believe the rhinos would ever come. When they finally arrived, everyone was impressed and certainly appreciated the magnitude of the work. 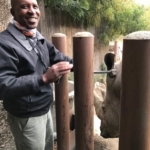 However, it was an even bigger impact and REALLY made them care about the rhinos when he told them that the reason he was getting to come to the U.S. was because of the rhinos. He told them that without the connections he had made with people through the rhino conservation work, he would never have been able to make the trip. He said that the respect for the rhinos increased even more when they realized what this project made possible for him personally. We all loved this story and had to share it with you. It really is not just about the rhinos! PARCA is thrilled to be hosting Vundi Kashamba who is visiting the U.S. for the first time. Vundi is a safari guide with Great Plains Conservation. Vundi ensured that the PARCA group who visited Africa last year had a phenomenal trip. We hope to do the same for him! Vundi is helping PARCA fulfull its education mission while he is here. 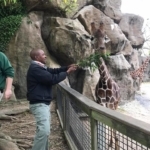 We visited the Philadelphia Zoo where he not only got to pet Tony the rhino and feed the giraffes, but he also delivered a talk to the zoo staff and docents. He also spoke at a reception along with Anna Rathmann, Director of the Great Plains Foundation. Anna and Vundi talked about Rhinos Without Borders, safari travel in Africa, and what the work of PARCA and Great Plains Conservation means to the communities. We learned that 43% of the local community has jobs related to ecotourism! We hope that Vundi has as great a trip to the U.S. as we did to Botswana. While the partnership we’ve been fortunate to develop with Great Plains is one we value highly, the friendships we’ve developed with individuals who share our passion is just as important to us. Welcome to the U.S., Vundi!